The Polish Lowland Sheepdog, also called the Polish Owczarek Nizinny, is also sometimes shortened to, and called, a PON. The dogs worked on the lowland plains. Some say that this medium-sized, robust sheepdog evolved from ancient, corded herding dogs from the Hungarian plains, which were bred with other small, long-coated mountain herders, and more recent, shaggy herders, such as the Scottish Bearded Collie and Dutch Schapendoes. It is also said to have Tibetan Terrier and Lhasa Apso in its blood. As with many breeds, World War II very nearly led to the breed's extinction and was revived by Polish breeders after the war. Popular in Poland and elsewhere, it is generally kept as a household companion, although it remains an excellent herder. It can also work in obedience, tracking, agility and therapy. •	animated, clever, happy and alert, with a great memory. •	Obedient, intelligent and very affectionate. •	Somewhat reserved and watchful with strangers. •	Easy to train, learns quickly and willing to please. •	Can be willful if owner doesn't set standards. •	Can be serious, and bite if provoked. •	Bred to herd this breed is known to nip at people's heels, a herding behavior. •	Great with children and other dogs, and OK with other non-canine breeds. 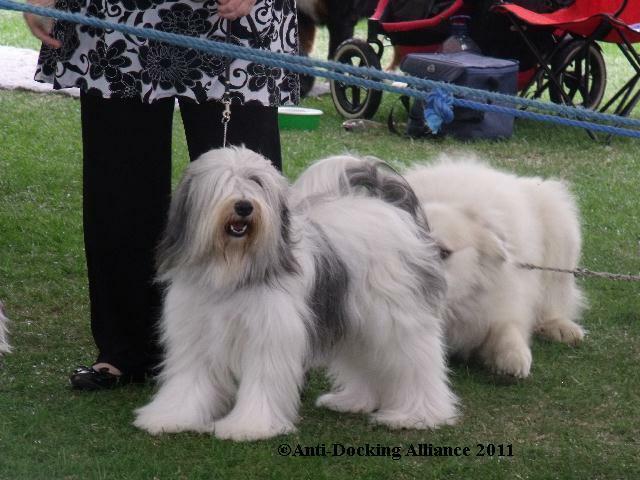 •	Happiest when given a job to do, this is a great breed for dog sports, especially herding sheep. •	They are a curious, muscular, agile dog that can find trouble if left alone and bored. •	Adaptable and a great travelling partner. The Polish Lowland Sheepdog is a medium sized, shaggy working dog. This darling, attractive, animated, clever, happy, and alert dog has a good memory. You'll find this breed to be very obedient, intelligent and affectionate. Somewhat reserved and watchful with strangers, it will announce visitors loudly. Dependable and fairly easy to train, once convinced the handler is a strong minded being that can take care of its "pack," the Polish Lowland Sheepdog will make the owner happy. It learns quickly and is very willing to please; however, it can be willful if it senses it is stronger minded than its owner. This breed is responsive to firm, fair obedience training, but he is also clever, strong-willed, and will think he knows best if you are not properly communicating with him. The Polish Lowland Sheepdog is a serious, responsible dog who could bite if provoked. This sheepdog may nip at people's heels, displaying herding behavior. The Polish Lowland Sheepdog is excellent with children when raised with them from puppyhood and/or properly socialized. This breed can be friendly with other dogs, but will hold their own if another dog tries to knock them out from being the leader. The Polish Lowland Sheepdog will usually do okay with other non-canine pets. As a working dog for many centuries, the Polish Lowland Sheepdog is happiest when it is given a job to do. Polish Lowland Sheepdogs are lively and clever enough to work sheep alone. The Polish Lowland Sheepdog is a curious, muscular, agile dog that is liable to find trouble if left alone without leadership and the proper mental and physical exercise. This breed needs an owner who is firm and consistent. Socialization and training are important. This breed is adaptable and makes a good traveling companion. The Polish Lowland Sheepdog is a working dog at heart. It once watched over herds and flocks on the Polish plains. This dog is definitely not suited to town or city life, unless you plan on spending a lot of time exercising and stimulating your dog. This intelligent dog needs stimulation and a job to do. Playing an active game of catch or Frisbee, or joining agility classes are just some of the things you can do to keep the Polish Lowland Sheepdog simulated and happy. If your dog is not actively working, it needs to be taken on a couple of daily long, brisk walks or jogs. While out on the walk the dog must be made to heel beside or behind the person holding the lead, as instinct tells a dog the leader leads the way, and that leader needs to be the human.